With Halloween weekend looming we have the perfect recipe for any party or even as a treat for the Trick or Treaters! The recipe is from Miele! Let us know on our Facebook page how yours turned out! Happy Halloween! 1. Preheat the Miele oven on Fan Plus 130°C. Line two baking trays with greaseproof paper and place a template with 5cm circles under the greaseproof, if needed. 2. Blitz the icing sugar and ground almonds in a food processor and pass through a sieve. 3. Using an electric hand whisk, whisk the egg whites in a large bowl to create a soft peak. 4. Gradually add the caster sugar. Once all the caster sugar has been added, whisk in the vanilla seeds. 5. Tip half of the icing sugar and almond mix into the meringue and fold in. Add the rest of the almond mix and fold in until you have a smooth mixture. 6. Preheat the Sous Chef food warming drawer on cup setting, first temperature square (40°C). Transfer the mixture to a piping bag with a 1cm nozzle. Pipe 5cm discs (either freehand or using the template) on to the greaseproof paper. Transfer to the Sous Chef and leave to dry for 10-15 minutes, or until the macaron surface is dry to touch. 7. When the macarons are dry, transfer to the preheated oven. 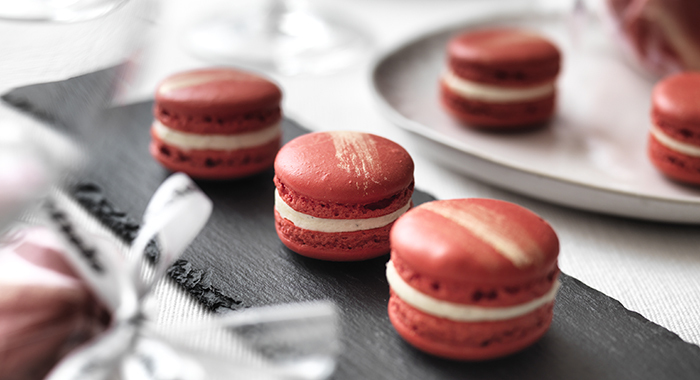 Bake at 130°C for 20-25 minutes or until the macarons have lost their “wobble” from the foot and are set. For more recipes please visit Mieles website.